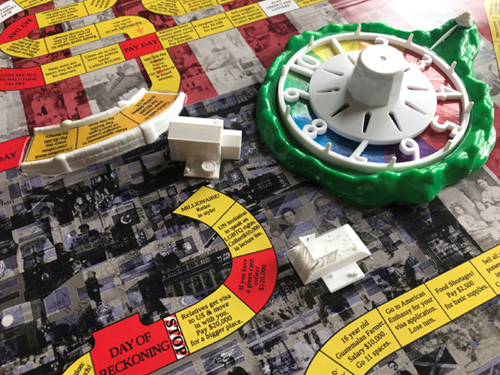 Life, Immigration Game, takes the original Milton Bradley Game of Life, and replaces the game tiles with new pieces which are related and relevant to the life of an immigrant to the United States. The game aims to educate native-born residents of the United States about the difficulties and joys of immigrating to America: all the cultural misunderstandings and rejections, the loss of a sense of home and belonging, as well as new opportunities and cultural freedom that come with making this radical change in one's life. This project is made possible in part with the support of the Puffin Foundation.